Follow George and grab a drink at Bluejacket Brewery near Nationals Park. Photo by Jeff Elkins. Where are you eating and drinking around Nationals Park this season? The good news: Navy Yard is in the midst of a restaurant and bar boom, so there are more options than ever, whether you’re looking for great places to drink outside, happy hour deals, quick bites, or a leisurely sit-down meal. The even better news: you have a full season ahead to try them all. 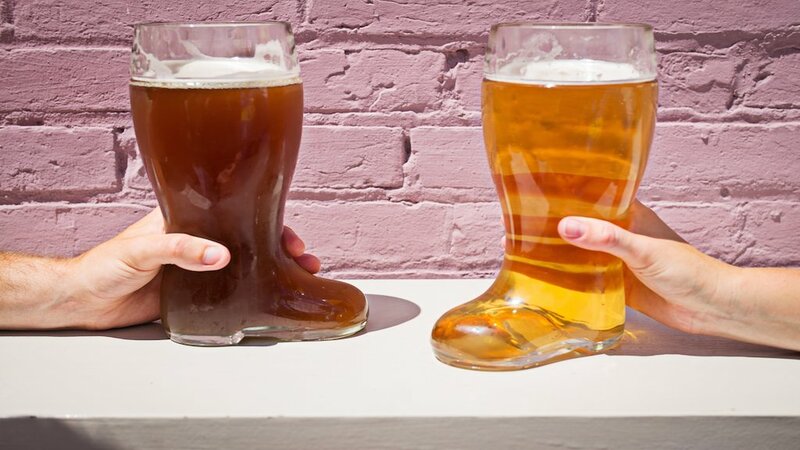 Dacha boots are headed to Navy Yard. Photoby Scott Suchman. Shaw’s popular beer garden is expanding to Navy Yard, located between the river and Nationals Park in the Dock 79 development. (An April opening is projected.) The indoor/outdoor concept will include a huge 800-person beer garden with 26 brews and a simple outdoor menu, as well as a full-service 150-seat restaurant and bar. The folks at Metropolitan Hospitality Group opened two concepts in one big space: a branch of their new American bistro, Circa, and an adjoining Mexican restaurant. The latter serves tacos, burritos, quesadillas, and margaritas—plus happy hour throughout the entire restaurant and outdoor patio. Both serve a generous brunch on weekends. The massive new Mexican restaurant near the front gates is taking its role as good Nats neighbor seriously. Happy hour runs every day (4 to 7 PM), and a 150-foot bar means there’s more elbow room for food and drink deals. Doors open early before games, and there’s brunch on weekends with bottomless margaritas for extra #natitude. Named for Washington Senator’s pitcher Walter Johnson (World Series 1924 winner), this baseball bar sounds like a perfect fit for Nats fans. It relocated from Park View to near the stadium’s front gates and is slated to open in early April. The owners, who’re also behind DC Reynolds and Looking Glass Lounge, installed a self-pour draft system with 24 taps and a 220-inch TV for catching the action. We’re big fans of this New York-style pizza chain, which opened its fourth DC-area location near Canal Park. Slices are huge and delicious (especially chicken parm and margherita). Like other branches, the place stays open late for those night games—from at least 11 PM on certain weeknights to 3 AM on weekends. The arrival of Whole Foods “South Capitol Hill” isn’t a neighborhood name game changer, but it can alter your ballpark picnic plans. Backpacks are no longer allowed in the stadium, but fans can still pack food in small, soft-sided coolers (and very limited, sealed water/juice). Our pick: cheffy cheesesteaks and waffle fries from chef Kwame Onwuachi‘s Philly Wing Fry stall within the new market. Not only are they delicious, nothing will piss Philly fans off like a mushroom cheesesteak with herbed yogurt and pickled chilies. DC’s Bluejacket brewery. Photo by Scott Suchman. 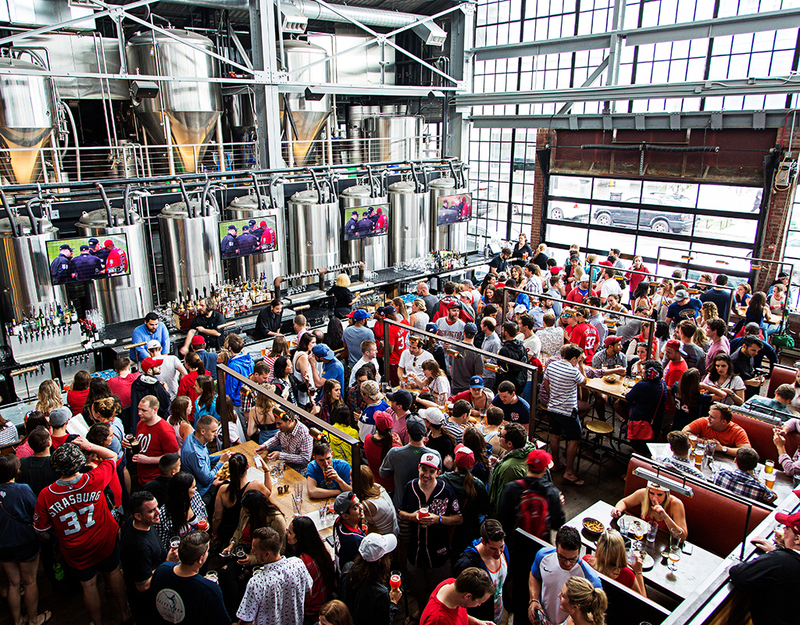 This massive brewery and beer garden perched on the Anacostia River is a quick walk to the south entrance of Nats Park. Fans will find seats for 750 over two acres, a dog park, ample bicycle parking, food trucks, and of course, plenty of beer. If you prefer a fresh German-style pilsner (or a sour blond with key lime and vanilla) over Bud Light, this brewery/bar/restaurant is your place. A grill patio launches for the Nats home opener and runs through the season with a special menu of outdoor eats like burgers and “boozy” wings. Just steps from the main entrance, this all-outdoor bar is home base for Nats fans. It’s open at least two hours before every game for easy-drinking tallboy beers, Red Bull-vodka slushies, food trucks, corn hole, and live music. Between the 3rd to 7th innings, happy hour drinks are $5. You can do a lot worse than grabbing a bottle of vino and hanging on the waterfront lounge/patio of this urban winery. In the smaller indoor bar area, bottles go for half-price during happy hour (3:30 to 6:30 PM weekdays). The bar area of this Southern barbecue spot packs them in on game days for beers, brown booze, and hearty fare like pulled pork nachos. Its satellite outdoor bar on the waterfront pier is open on home game days with a full bar and more snacks. Justin’s Cafe sadly shuttered in the off-season, but its sibling bar is still going strong. The menu centers around brews that can be ordered in 20-ounce mugs, sausages, and “shotskis” (shots served on a ski). Happy hour runs Monday through Friday, 3 to 7 PM, as well as every night from 10 PM to close with deals on drinks, apps, and beer-and-shot combos. Fans can wear red and drink pink at Whaley’s rosé garden (slated to open in late April, depending on the weather). Go for the blush wines, stay for boozy slushies and a light snack menu. Oysters at the Salt Line. Photo by Scott Suchman. A second location of chef Michael Friedman’s uber-popular pizzeria is a great addition to the Nats Park dining and drinking scene. The Italian-American lineup includes deck-oven pies, eggplant parm, and crispy calamari. A roomy patio and roof deck bar are great for water ice cocktails. Chef Haidar Karoum’s eclectic new American restaurant isn’t too fancy for Nats fans (especially the bar ), though you won’t find wings and beer. Think seafood gumbo or spice-roasted Vietnamese chicken instead. Want to escape the crazy pre- and post-game fray? This waterfront Italian restaurant has a spacious bar (with TVs!) and dining room, plus the outdoor patio is lovely in warm weather. Order homemade pastas and wood-grilled meats and seafood. Chef Kyle Bailey knocked it out of the park with the debut of this New England-inspired seafood spot. (It doesn’t hurt that Zimm is partner). A big waterfront bar area means you can pre- and post-game outdoors steps from the south entrance. The proximity to the stadium means you’ll definitely want to make reservations for a sit-down meal on game days. After turning into a Japanese hot pot pop-up for winter, seafood-centric Whaley’s is back. The fare is higher-end and inventive—think oyster toast or shareable seafood risotto—though the place isn’t too fancy for game day. 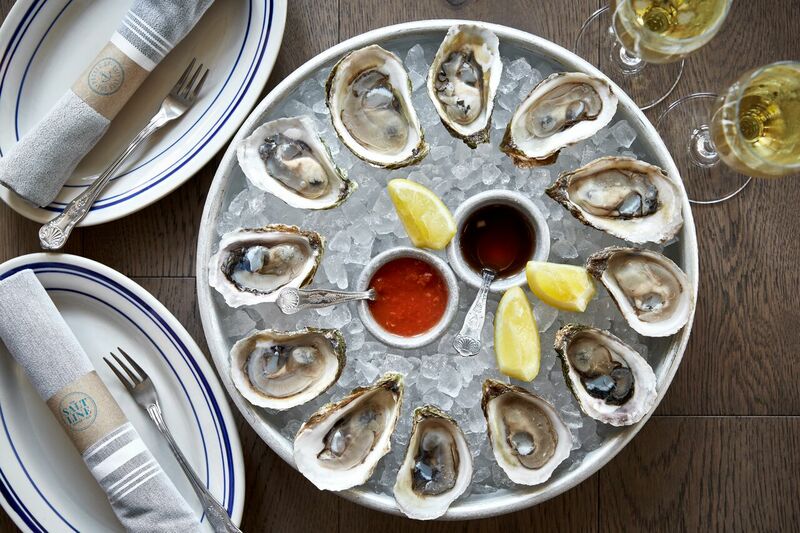 Drop by the U-shaped bar for daily happy hour (5 to 7 PM) for fresh-shucked $1.25 local oysters, $9 cocktails, and more. Korean fried chicken wings at Bonchon. Photograph by Scott Suchman. 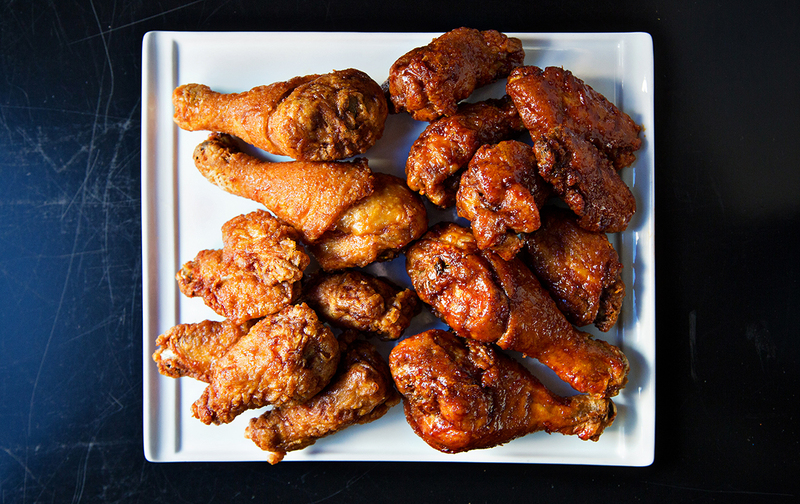 This Korean fried chicken chain double-fries up some of the best wings in town. The Navy Yard location is designed with sports fans in mind, including a 90-seat bar area, many TVs, and a long list of beers. The second pizzeria from DC’s presidentially themed restaurant group is even bigger than the Shaw original with 100 seats and a walk-up outdoor bar. The menu is also bigger with regional American eats like Philly-style cheesesteaks. This local ice cream purveyor serves delicious scoops and helmet sundaes with fun flavors like Thai iced tea or Snickers snickerdoodle. Grab a cone and walk along the boardwalk to the stadium. Indian goes fast-casual in this bright, colorful space where customers can design their own bowls—with plenty of vegetarian options—or opt for house combos like turmeric shrimp with South Indian rice noodles, veggies, and chutneys. Wash it down with a mango lassi or draft gin and tonic. You don’t need to waste multiple innings waiting in line for your Shack fix inside the stadium given there’s a branch of the burger joint across from the Park. Fast-casual, Korean-style “takos” and bowls topped with kimchi slaw are great for an easy pre-or-post game bite (or take them to-go). There’s draft beer and sake if you decide to stay.